This locally hand made beaded AZ Petrified Wood and Sterling Silver necklace is 18 inches long. The pendant is 10 x 8mm. This item ships free anywhere in the continental USA. This locally hand made beaded AZ Petrified Wood and Sterling Silver necklace is 16 inches long. The pendant is 10 x 8mm. This item ships free anywhere in the continental USA. This locally hand made beaded AZ Petrified Wood and Sterling Silver necklace is 16 inches long.The pendant is 8mm. This item ships free anywhere in the continental USA. This locally hand made beaded AZ Petrified Wood and Sterling Silver necklace is 15 inches long.The pendant is 18 x 25mm. This item ships free anywhere in the continental USA. This locally hand made beaded AZ Petrified Wood and Sterling Silver necklace is 17 inches long. This item ships free anywhere in the continental USA. This locally hand made beaded AZ Petrified Wood and Sterling Silver necklace is 16 inches long. The pendant is 30 x 40mm. This item ships free anywhere in the continental USA. This locally hand made beaded AZ Petrified Wood and Sterling Silver necklace is 20 inches long. The pendant is 30 x 22mm. This item ships free anywhere in the continental USA. This locally hand made beaded AZ Petrified Wood and Sterling Silver necklace is 18 inches long. The pendant is 3/4 of an inch. This item ships free anywhere in the continental USA. This AZ Petrified Wood and Sterling Silver necklace is 16 inches. It is made by a local artist. This item ships free anywhere in the continental USA. This AZ Petrified Wood and Sterling Silver necklace is 20 inches. It is made by a local artist. This item ships free anywhere in the continental USA. This locally hand made beaded AZ Petrified Wood, Turquoise and Sterling Silver necklace is 20 inches long. The pendant is 30 x 40mm. This item ships free anywhere in the continental USA. This locally hand made beaded AZ Petrified Wood, Turquoise, and Sterling Silver necklace is 18 inches long. This item ships free anywhere in the continental USA. This locally hand made beaded AZ Petrified Wood, Turquoise, and Sterling Silver necklace is 17 inches long. The pendant is 10 x 8mm. This item ships free anywhere in the continental USA. This locally hand made beaded AZ Petrified Wood, Turquoise, and Sterling Silver necklace is 16 inches long. The pendant is 10 x 8mm. This item ships free anywhere in the continental USA. This locally hand made beaded AZ Petrified Wood, Turquoise, and Sterling Silver necklace is 16 inches long. This item ships free anywhere in the continental USA. This locally hand made beaded AZ Petrified Wood, Turquoise, and Sterling Silver necklace is 16 inches long. The pendant is 18 x 25mm. This item ships free anywhere in the continental USA. This locally hand made beaded AZ Petrified Wood, Turquoise, and Sterling Silver necklace is 16 inches long.The pendant 18 x 25mm. This item ships free anywhere in the continental USA. This locally hand made beaded AZ Petrified Wood, Turquoise,and Sterling Silver necklace is 16 inches long. The pendant is 25 x 18mm. This item ships free anywhere in the continental USA. This locally hand made beaded AZ Petrified Wood, Turquoise, and Sterling Silver necklace is 18 inches long. The pendant is 10 x 8mm. This item ships free anywhere in the continental USA. This locally hand made beaded AZ Petrified Wood, Turquoise and Sterling Silver necklace is 18 inches long. The pendant is 30 x 40mm. This item ships free anywhere in the continental USA. This locally hand made beaded AZ Petrified Wood, Turquoise and Sterling Silver necklace is 19 inches long. The pendant is 30 x 40mm. This item ships free anywhere in the continental USA. This locally hand made beaded Turquoise, AZ Petrified Wood, and Sterling Silver necklace is 18 inches long. The Turquoise pendant is 7/8 of an inch. This item ships free anywhere in the continental USA. This locally hand made beaded Turquoise, AZ Petrified Wood, and Sterling Silver necklace is 17 inches long. The Turquoise pendant is 1 1/2 inches long. This item ships free anywhere in the continental USA. 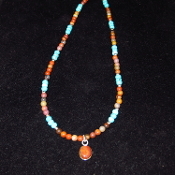 This locally hand made beaded Turquoise, AZ Petrified Wood, and Sterling Silver necklace is 16 inches long. 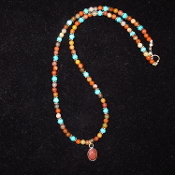 The Turquoise pendant is 1 5/8 inches long. This item ships free anywhere in the continental USA. This locally hand made beaded Turquoise, AZ Petrified Wood, and Sterling Silver necklace is 20 inches long. The Turquoise pendant is 1 1/2 inches. This item ships free anywhere in the continental USA. This locally hand made beaded Turquoise, AZ Petrified Wood, and Sterling Silver necklace is 18 inches long. The Turquoise pendant is 1 3/8 inches long. This item ships free anywhere in the continental USA.